Every once in a while I get lucky, lucky that I don't have to choose the restaurant for an evening out. Eric and I made plans with friends Eric and Juliana but let them decide the location. Sawtooth had been on their list with many false starts, so it was an easy and natural choice for a Saturday night destination. 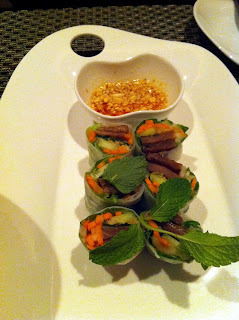 Located on the far west end of West Town on Randolph, Sawtooth is a new Vietnamese restaurant and lounge. The decor is an interesting modern look with lots of whites and glass. They also have a nice outdoor patio area for the warmer months, the opposite of the rainy chilly night we went. The main dining room is on the first floor while the lounge space overlooks the bar area. It is a rather small dining room and a narrow space, but they have done a good job with separation between tables to avoid the feeling of eating next to strangers. Our first surprise came on the cocktail list. They have a nice and complete wine list, in addition to a number of beers on tap or bottle. But glancing at the specialty cocktails gave the impression of fruity beach drinks. There was nothing wrong with those options (i.e. dalat-a-love, Summer in Saigon, Mehkong Mojito, etc. ), just unexpected, especially on a rainy fall evening in the city. The drinks came out great with high praise. We started the meal with three starters: spring rolls, pork rolls and banh xeo (Vietnamese filled fried pancake). My favorite was the spring roll served with delicious spicy peanut sauce. 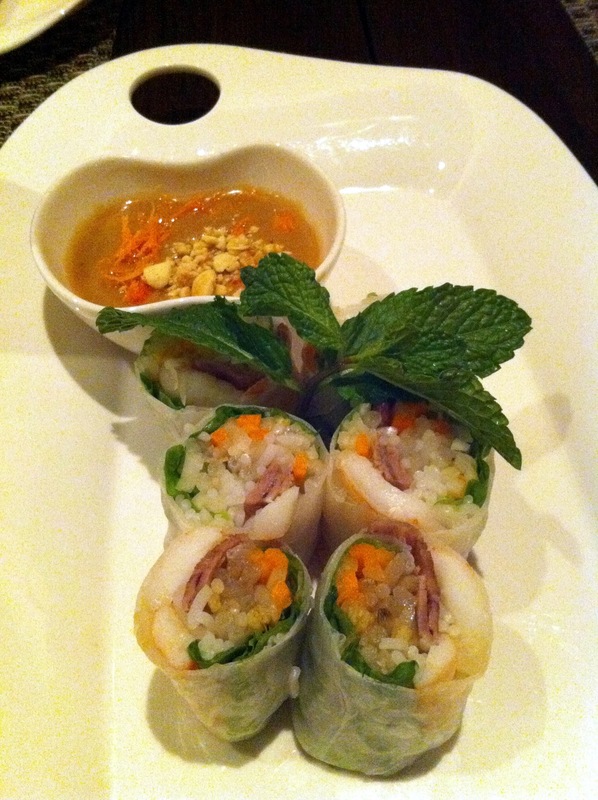 The pork roll was very similar, and I don't recommend order two rolls, just pick one. 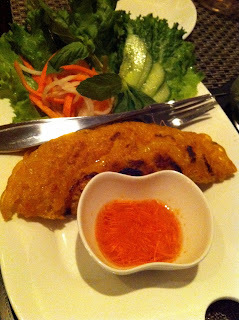 The banh xeo was the least enjoyed and least interesting. It resembles a large, fried hot pocket stuffed with vegetables. There wasn't a lot of flavor, too much fried dough and too difficult to share. Notice the thumb holes in the plates. All of the plates had unique or fun modern twists that were noticed by everyone. It was a nice touch that matched the environment and feeling. 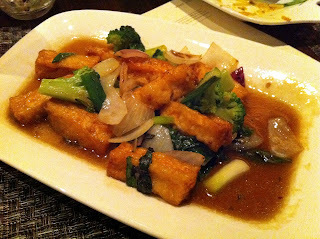 For my main course I was in a vegetarian mood and ordered the basil tofu and smoked eggplant dishes. I should have ordered a side of rice to help soak up the sauces and diffuse some of the strong spices. The basil tofu was very good, not overly cooked and served in a light sauce with broccoli and onions. I highly recommended that dish. 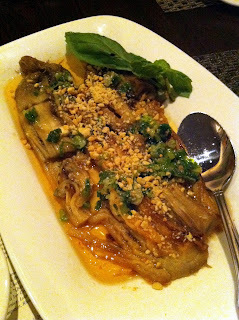 The eggplant was not as good, but mostly because the flavors were too strong. After a handful of bites I had to stop and regroup, eat some rice and drink some sake. I know some people think eggplant is bland and in need of spices but this was too much for me. 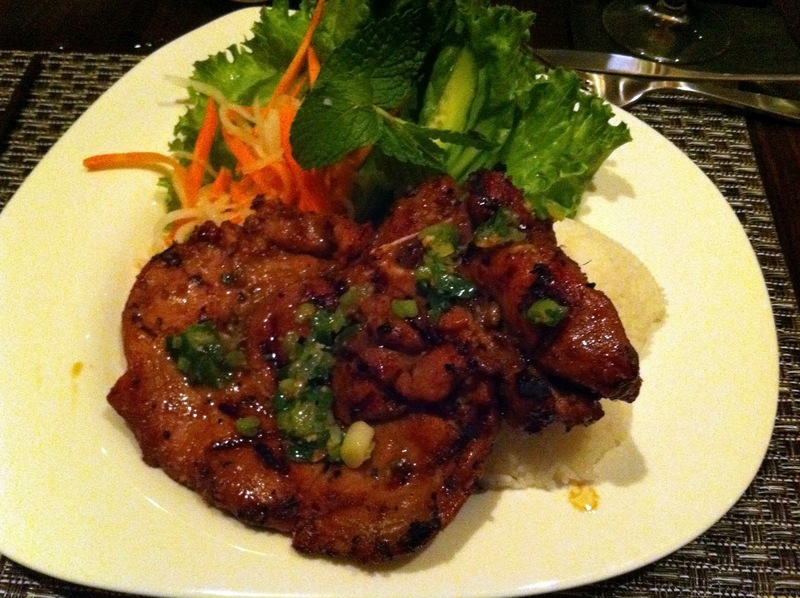 Erica ordered a very tasty grilled pork chop. She too did not finish her dish citing an exhaustion of taste buds. I tried a piece and thought it was very good, but I can understand not being able to eat an entire chop. Juliana said her seafood clay pot was bland throughout, and Eric's chicken curry was good but very spicy. Our experience at sawtooth was pleasant, allowing us to enjoy the good company of friends. I'm sure the patio is fun when it's open. 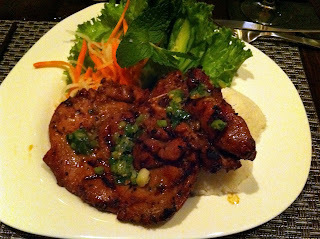 While the value is good (main dishes ~ $15, starters ~ $8), the quality and flavors are inconsistent and volatile. We had no complaints from the drinks, though Eric and I tried to order a bottle of sake, which led to an interesting exchange... I would not rush back to eat at Sawtooth but could suggest checking out the "lounge" to focus on drinking and ordering small plates to snack.